The 5th Amendment is about Trial and Punishment and its provisions were extended in 1966 to include the reading of rights - the Miranda Rights. Summary: The 5th Amendment states that the government must follow the due process of the law before punishing a person and that all citizens had the right to a trial by jury. It also states that a person cannot be put on trial twice for the same crime or that person on trial for a crime does not have to testify against themselves in court - "Pleading the 5th". 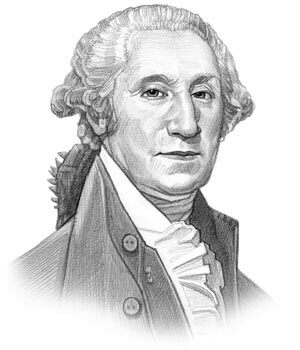 George Washington was the first American President who served in office from April 30, 1789 to March 4, 1797. One of the key events during his presidency was the ratification of the 5th Amendment to the Constitution. The first 10 Amendments to the Constitution are collectively known as the Bill of Rights. The Bill of Rights, which includes the 5th amendment, was ratified (meaning approved) on December 15, 1791. The cause or reason for this addition to the Constitution was due to the British refusing to grant the same rights to American subjects as they gave to people in Great Britain. Many people were jailed without even being accused of a crime. This specifically referred to the right of a Trial by Jury and the right not incriminate themselves. The 5th Amendment is also referred to as the Double Jeopardy and the Due Process Clause. Both the 5th and 14th Amendments to the US Constitution contain a Due Process Clause. 'Due process' deals with the administration of justice and the Due Process Clauses act as safeguards from arbitrary denial of life, liberty or property by the Government, outside the authorization of law. "No person shall be held to answer for a capital, or otherwise infamous crime, unless on a presentment or indictment of a Grand Jury..."
Meaning: The early American colonists believed that all Americans, like the people in Great Britain, had the right to be tried by a jury. The 1798 Vice Admiralty Court Act, one of the laws in the Townshend Acts, created new Admiralty Courts in which colonial smugglers would be prosecuted without a jury in which the verdicts would be decided solely by the judge. This important section of the Bill of Rights made it completely clear that every person had the right to a trial by jury. "...except in cases arising in the land or naval forces, or in the Militia, when in actual service in time of War or public danger..."
Meaning: An exception to the right to a trial by jury related to violations of Military Law. This clause was saying that people serving in the military could be put on trial without an indictment or a grand jury, if they committed a crime during war or a national emergency. "...nor shall any person be subject for the same offense to be twice put in jeopardy of life or limb... "
Meaning: A person who has been acquitted in a trial by jury they may not be put on trial again. This is now referred to as the Double Jeopardy Clause. "...nor shall be compelled in any criminal case to be a witness against himself..."
Meaning: The words "Pleading the 5th Amendment" are familiar to most people. This the clause that is being referred to. It is saying that the government cannot make a person testify against themselves. A trial relies on witnesses and evidence and not the testimony of the accused. "You have the right to remain silent. If you cannot afford an attorney, one will be appointed for you." Meaning: Due Process of law is the procedure which makes sure that everyone gets treated fairly and in the same way by the police, the courts, and the government. Many court cases have been dismissed because 'due process rights' have been violated. Meaning: The government cannot take land without compensating the owner for the market value of the property - for instance if a new road was to be built. Who wrote the 5th Amendment of the Constitution? James Madison, the "Father of the Constitution", wrote the 5th Amendment in 1789 as one of the first 10 amendments collectively known as the Bill of Rights. The 5th amendment about Trial and Punishment was ratified on December 15, 1791. The article on the 5th Amendment of the Constitution provides the text, definition and history of one of the major achievements of his presidential term in office. The following video will give you additional important facts and dates about the political events experienced by the 5th American President whose presidency spanned from April 30, 1789 to March 4, 1797.